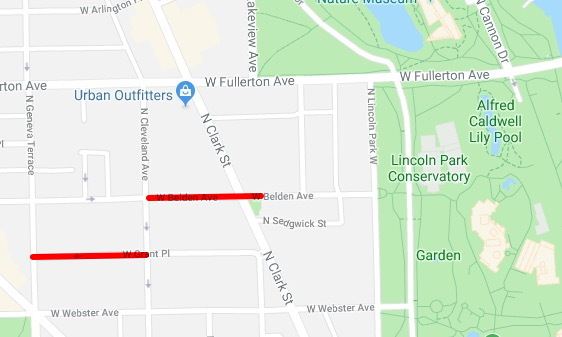 The incidents were reported in the 400 block of West Belden (top) and the 500 block of West Grant. Police are on the hunt for a man who entered two Lincoln Park homes early Sunday morning and made sexual advances toward underage girls who were asleep in each residence. The home invasions occurred within a block of each other. Around 2 a.m., the man entered a home in the 400 block of West Belden and made sexual advances toward an underage girl who was asleep in her bedroom, police said in a community alert. About 20 minutes later, the same suspect is believed to have entered a home in the 500 block of West Grant where he made sexual contact with a juvenile girl who was also asleep, according to police. The man fled the area in an unknown direction. The offender is described as white, 20- to 30-years-old, about 5’7” tall and 160 pounds with short brown or strawberry blonde hair. He smokes cigarettes. Police are urging residents to always lock their doors and to call 911 to report suspicious activity. Anyone with information about the two incidents on Sunday can contact Area Central investigators at (312) 747-8380.